Direct flights between Perth and Tokyo may be on the horizon. Travellers can feel at home in the Japanese capital and enjoy authentic experiences. When I’m staying in Tokyo, I want to feel I’m staying in Japan. While the big international hotel chains in Tokyo are pretty much the same as everywhere else, Keio Plaza Hotels are different. For Keio is a Japanese success story — and to stay at the Keio Plaza Hotel Tokyo is to stay somewhere Japanese. While the Keio Plaza Hotels name isn’t well known internationally, mention it to Japanese people, and particularly the residents of Tokyo, and Keio is as familiar as Coke. The group is expanding in Japan. The company is held in high esteem. Indeed, there is a Keio train line, Keio taxis and when I visit Mt Takao, just over an hour on the train from the hotel, the lanterns lining the paths are sponsored by Keio. But the Keio Plaza Hotel Tokyo in the city’s Shinjuku district is the company’s flagship — a 1438-room hotel with 15 restaurants and seven bars. It is a landmark and embedded in the physical and cultural landscape of Tokyo. And that history is encapsulated in one black and white photograph. It was taken in 1971, when the hotel was built — a behemoth building rising these 45 storeys from what looks like a rather deserted urban landscape. “We were the first skyscraper hotel in Japan,” says Junko Saito, explaining the hotel’s history and the vision of founder Mr Sadao Inoue to me. He was correct, and the 34-floor South Tower was built in 1981. 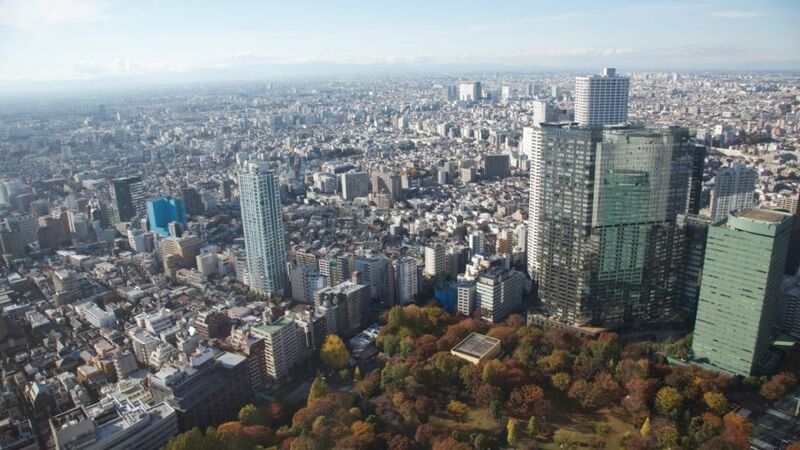 More than 25 million guests from 100 countries have stayed at Keio Plaza Hotel Tokyo and Shinjuku is, indeed, a thriving city within the city, and the home of government, with the epic Tokyo Metropolitan Government Building now facing the hotel. The hotel’s history and experience show in other ways, like the walking maps, borne out of experience, detailing the best of local streets, offered to guests — the Noodle Map, the Sushi Map and the Shopping Map among them. More than 50 tours leave from the hotel, from general sightseeing to visiting sake producers, and there are free shuttle buses to Tokyo Disneyland. From a Club Floor room, exploring is even easier with the free loaned smartphone, loaded with information and enabled to make local calls. And so, from my temporary home in the small Japanese town that is the Keio Plaza Hotel Tokyo (a town with a population about the same as our Denmark), the rest of the city opens up easily through tour excursions and simply by stepping out of the door and wandering the safe, interesting backstreets of Shinjuku. Keio Plaza Hotel Tokyo’s Club Floors were opened last December — 100 Club Rooms including 11 suites over the hotel’s top five accommodation floors, topped on the 45th level by the Club Lounge. Its Club Lounge embodies the Japanese love of apparent uniformity and variation through subtlety. In this one room there are 22 kinds of chair and 15 kinds of table, blended into one contemporary and calm environment. The art on the walls is sparing and by young local artists. Glass panels frame Japanese art papers. Breakfast is served here, from an exquisite omelette placed with chopsticks like an artwork on your plate to a full traditional Japanese breakfast. The Club Rooms are elegant and contemporary, virtually silent and with electric curtain blinds that block out even the night lights of Tokyo. In the separate toilet room … well, you may wish to never turn on a light, open a toilet lid or press the flush again. Keio Plaza Hotel Tokyo’s Club Floors were opened last November — 100 Club Rooms including 11 suites over the hotel’s top five accommodation floors, topped on the 45th level by the Club Lounge. Kaiseki is a traditional Japanese dinner of many courses, and they are flowing now in Keio Plaza’s Soujuan restauraunt. First there is homemade black sesame tofu and angler fish; three types of sashimi; grilled rockfish with mullet roe, Wagyu beef and steamed abalone. And then, as the main course, light and sweet fugu — skilfully prepared blowfish. Crabmeat and seaweed is followed by red miso soup, pickles and Japanese sweets. This is Japanese fine dining at its best. There are seven restaurants and bars in the hotel. There’s teppanyaki at the restaurant Yamanami, tempura at Shun, sushi at Kyubey, soba noodles at Fumotoya and Japanese cuisine at Kagari. To widen the mix, there are also restaurants with Chinese, Korean, French and Italian food, and the “super buffet” at Glass Court. The sake bar called Amanogawa is popular, but Keio Plaza is also known for its cocktails. It prides itself on its restaurants (and people have come to dine or drink here more than 85 million times) and the fact that they are not franchised, but part of the whole culture of the hotel. A standard room at Keio Plaza Hotel Tokyo is $290 a night. A Premier Grand room on a new club floor is $490 a night. The tea ceremony is $24. See keioplaza.com and phone +81 3 3344 0111.